Based on the R&S CMW platform, the latest version of the R&S CMW100 communications manufacturing test set is preparing the industry for 5G new radio (NR) sub-6 GHz devices. 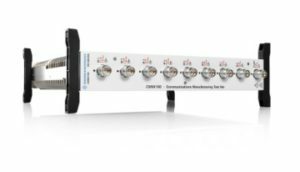 Rohde & Schwarz, a leading supplier of test and measurement equipment, is enabling the testing and validation of sub-6 GHz 3GPP 5G new radio (NR) based devices. 3GPP’s 5G NR will support frequency ranges up to 52.6 GHz, but initial 5G designs will use frequencies below 6 GHz with a focus on 3.5 GHz. For these sub-6 GHz carrier frequencies, 3GPP currently discusses a maximum bandwidth per component carrier of 100 MHz. Thus, the R&S CMW100 communications manufacturing test set with a measurement bandwidth of 160 MHz is ready for testing initial 5G NR sub-6 GHz wireless devices. Thanks to its high measurement speed, the R&S CMW100 is an ideal solution for high-volume production environments. The latest 160 MHz version of R&S CMW100 is available now from Rohde & Schwarz. Dedicated vector signal analysis and generator software options supporting 5G NR sub-6 GHz will be available in 2018. This entry was posted in Europe, Frequency Control Products, Frequency Control Products, Frequency Control Products, Miscellaneous, Miscellaneous, Miscellaneous, On Ticker, top articles, UK. Bookmark the permalink.